A narrow majority of Egyptians support the military’s removal of Mohamed Morsi from power last year, and the same percentage has a positive opinion of the man who replaced him as the country’s most powerful figure, Abdel Fattah El-Sisi. Support for Morsi and his organization, the Muslim Brotherhood, is down significantly from 2013, although about four-in-ten Egyptians continue to back the former president and the now outlawed Brotherhood. At the same time, the military is increasingly criticized for being a negative influence on the country. The tumultuous year has also damaged the image of the courts, religious leaders and the media. In addition, a broad majority of Egyptians say the government does not respect citizens’ personal freedoms. A year later, Morsi’s removal from office divides Egyptians. Overall, 54% say they favor the military’s ousting of Morsi. A significant minority (43%) opposes it. The issue highlights clear rifts within Egyptian society. Younger people are more supportive of Morsi’s removal than those age 50 and older. Low-income Egyptians are considerably more likely to say they favor the military’s ouster of Morsi than wealthier people.1 And Egyptians who do not want their laws to strictly adhere to the Quran are happier that Morsi is no longer in power than those who say the legal system should closely follow the Quran. Abdel Fattah El-Sisi, whom many observers expect to win the controversial upcoming presidential elections, receives lukewarm reviews from the public. Little more than half of Egyptians (54%) say they have a favorable image of Sisi, while 45% rate him negatively. There are few demographic divisions over Sisi – young and old, rich and poor, men and women alike give the presidential candidate a moderately favorable rating. Just 42% of Egyptians hold positive views of former President Mohamed Morsi, down from the 53% who rated him favorably last year. Low-income Egyptians are particularly unlikely to give Morsi a positive rating (30%) compared with middle-income (42%) and high-income people (46%). Those who would like to limit the influence of the Quran on Egypt’s legal system (34%) are less enamored of Morsi than those who prefer a central legal role for the Islamic holy book (49%). Besides these two key figures in Egyptian politics, other leaders inspire little confidence from the public. Roughly a third (35%) gives favorable reviews to Hamdeen Sabahi, the only other declared candidate for the presidential election. A similar percentage (33%) says the same about Abdel Moneim Aboul Fotouh, a former Muslim Brotherhood member and 2012 presidential candidate who is boycotting the upcoming elections. Mohamed ElBaradei, a more secular leader who was an advocate for the removal of both Mubarak in 2011 and Morsi in 2013, is also broadly unpopular (27% favorable, 69% unfavorable). There also appears to be no nostalgia for former President Hosni Mubarak, who was recently convicted of embezzlement. 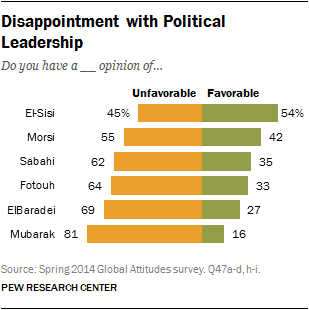 Roughly eight-in-ten Egyptians (81%) rate Mubarak unfavorably, including 56% who view him very unfavorably. However, the public’s dislike of Mubarak has softened somewhat in the past three years – in 2011, 76% said they had a very unfavorable opinion of him. Egyptians are decidedly unhappy with many of the organizations that have played a central role in the political drama of the last several years. The April 6th Movement – a relatively secular group that helped topple Mubarak as well as Morsi, but is now outlawed – fares the best: nearly half (48%) say they have a favorable view of the movement while a roughly equal percentage (50%) rate it negatively. The Tamarod Alliance, the leading organization that spearheaded the protests that helped to unseat Morsi, is less popular. Just four-in-ten Egyptians give the group positive reviews, and nearly six-in-ten (58%) have a negative opinion. Roughly four-in-ten (38%) rate the now banned Muslim Brotherhood favorably. The organization’s popularity has declined considerably since the spring of 2013 when it stood at 63%. The Al-Nour party, a Salafist political party that supported Morsi’s removal in 2013, is disliked by a majority of Egyptians (59%). Little more than a third (36%) give the group positive ratings. The military has garnered widespread positive reviews over the past few years. 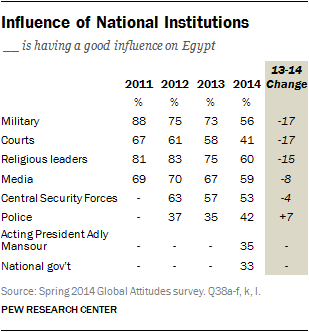 But while a majority of the public (56%) continues to say the military has a good influence on the way things are going in Egypt, more than four-in-ten (45%) say the military’s influence is bad. And support for the armed forces is considerably lower today than it was just last year, when nearly three-quarters said the military had a positive impact (73%). Respect for the court system has also dropped substantially in the past 12 months.2 In 2013, about six-in-ten Egyptians (58%) thought the courts had a good influence on their country. Today, just 41% say the same. Similarly, religious leaders are less likely to be seen as a positive force in the nation. Three-quarters of the public gave religious leaders high ratings in 2013, compared with 60% now. Nearly six-in-ten Egyptians (59%) think the media is having a good impact on the way things are going in the country – also a drop since 2013 (67%). Roughly half (53%) give the Central Security Forces high ratings. And the local police force’s image has rebounded somewhat from 35% positive last year to 42% this year. Finally, at the bottom of the list are the acting President Adly Mansour (35% good) and the national government more broadly (33%). One reason the government may be faring so poorly is that a broad majority (63%) of the public believes the government does not respect the personal freedoms of Egyptians. This is a significant shift from 2013, when people were more likely to say the government upheld civil liberties (51% said it does, 44% said it does not). Those who are favorable toward the Muslim Brotherhood are particularly likely to say the national government does not respect Egyptians’ personal freedoms (71%). Still, 58% of people who have a negative opinion of the Muslim Brotherhood also believe the current government violates people’s civil liberties. Overall, low-income Egyptians are much more likely than wealthier individuals to give the government, the acting president, the military and the courts high ratings. In addition, 46% of low-income people say the government respects personal freedoms while few middle-income (35%) and upper-income Egyptians (30%) agree.